Happy Halloween Friday! Watch Daniel Radcliffe rap, wedding guests drink Fireball and become your own ghost hunter. Happy Halloween! How cool is it that it FINALLY lands on a Friday? We’ve got a variety today, a mix of spooky and funny. Well, more funny and cute, really. Hope you enjoy and don’t get into too much mischief tonight. Who doesn’t like a little Fireball with their GoPro? Wedding guests got creative at a wedding for Brian and Allie … the video descriptor was simply, “Congrats Brian and Allie!” Yes, congrats, guys. Cheers! Want to Become Your Own Specter Spy? If you want to unleash your inner ghost hunter tonight, check out Specter Spy. This app literally turns your smartphone into a paranormal investigator. Spooky, right? Reporter Ginger Chan of KTLA 5 in Los Angeles called co-worker Sam Rubin “fat” on-air. Her reaction to realizing her mic was on while she said it is priceless. Apparently, they hugged it out afterward. Color me impressed. Harry Potter’s got skills. 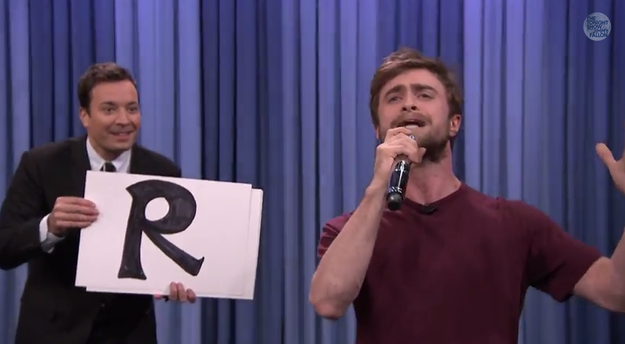 Watch Daniel Radcliffe kill Blackalicious’ Alphabet Aerobics. Wow. OMG, pets in costumes. Not so much scary as it is a cuteness overload.